8 August 1914: Entered the Army as a War Volunteer. 2 August 1915: Commissioned a Leutnant in Infanterie-Regiment Kaiser Friedrich, König von Preußen (7. Württembergisches) Nr.125. 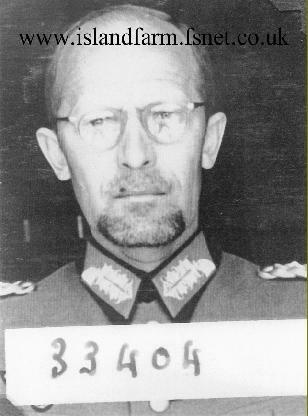 19 April 1945-Circa 1947: Prisoner of war. 10 May 1945 transferred to Trent Park Camp 11 sorting camp. 1976: Published the divisional history Der Weg der 5. Infanterie- und Jäger-Division 1921-1945 (The Journey of the 5th Infantry- and Jäger Division, 1921-1945). 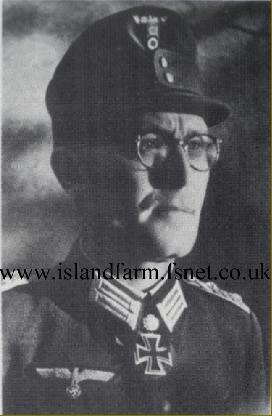 Knight’s Cross of the Iron Cross: 30 June 1941, Oberst, Commander of Infantry Regiment 56. Oakleaves (No. 166): 23 December 1942, Oberst, Commander of Jäger Regiment 56. Prussian Iron Cross, 1st Class (1914): 3 July 1918. Prussian Iron Cross, 2nd Class (1914): 26 August 1915. 1939 Bar to the Prussian Iron Cross, 1st Class: 13 June 1940. 1939 Bar to the Prussian Iron Cross, 2nd Class: 3 June 1940. Mentioned in the Wehrmachtbericht [Armed Forces Communiqué]: 5 July 1941. At the start of Operation “Nordwind,” Himmler’s Army Group Oberrhein controlled four corps headquarters: the LXIV Army Corps and LXIII Army Corps under General der Infanterie Siegfried Rasp’s 19th Army in the Colmar Pocket and the XIV SS-Army Corps and XVIII SS-Army Corps on the east bank of the Rhine. On 24 January 1945, Himmler’s army group staff transferred to the Eastern Front where it was redesignated Army Group Weichsel [Vistula].